Widnes provided the English game with a substantial boost as they turned on the style to beat Australian champions Canberra Raiders in front of some 30,786 people at Old Trafford on Wednesday 4th October 1989. Just looking at the result it would appear that Widnes were comfortable winners but that hides the whole truth of a game, which took true grit and determination to win. In the opening 25 minutes Widnes looked decidedly ropey in defence and seemed to lack any ideas or cohesion in attack and Canberra looked as if they might inflict an embarrassing score on the men from Naughton Park. The opening 25 minutes saw Canberra turn the screw on the Widnes defence and raced into a 12 point lead with every attack seemingly threating to put points on the board. Their running was strong and hard, their handling seemingly faultless and with fiercely strong support play it was seemingly inevitable when Canberra captain Mal Meninga crossed in the 8th minute and Chris O'Sullivan went over in the 11th minute, and if this had been a boxing match, the tie would most certainly have been stopped as Widnes sagged and wilted on the ropes. However, this wasn't a boxing match and some desperate tackling and gritty determination saw off the killer blows and gradually Widnes clawed their way back into the match. To be fair the Widnes play hadn't been flowing but with the half-time interval fast approaching, they were amazingly only 4 points down. Paul Hulme scored the first Widnes try after some neat, enterprising play had seen the ball move down the right before switching sharply to the left with the crucial gap being prized open by some neat play by Joe Grima and man-of-the-match, David Hulme. Some 8 minutes later Martin Offiah scored his first of 2 tries on the night after he found space down the wing after a Derek Pyke offload had sent Phil McKenzie through a gap in the Canberra defence. At half-time the Widnes outfit were trailing by a mere 2 points which would have seemed out of the question with around 15 minutes gone, and were further boosted by the sight of Meninga limping out of the game. The first 5 mins of the second half effectively sealed the game in Widnes' favour. Some enterprising play by Widnes saw Davies head for the corner for a certain try, only for Laurie Daley to come steaming across in a late attempt to foil the try. Call it desperation or what you will, but Daley almost took the Welshman's head off in one of the few really vicious incidents on the night, ironically Davies still managed to ground the ball and the incident cost Daley 10 minutes cooling down time in the sin bin. The Australians never fully recovered from this and 2 minutes later Offiah raced away to score in the corner following a great break by Darren Wright from a short offload in the tackle from Joe Grima. The next try came after after some enterprising play that covered almost the length and width of the pitch, with Richie Eyres finishing it off in suitable fashion, weaving his way over with some nifty foot work. The game was well and truely over when, after Daley had dropped the ball over the Widnes line, Sorensen took a quick tap and fed the ball to Barry Dowd, who after two outrageous dummies and some fifty yards later, fed the ball to the supporting Wright who raced away unopposed to score under the posts. Canberra had the last word on the try scoring count when Steve Walters crossed from close range but it was too little too late for a Canberra side who were well beaten on the night. 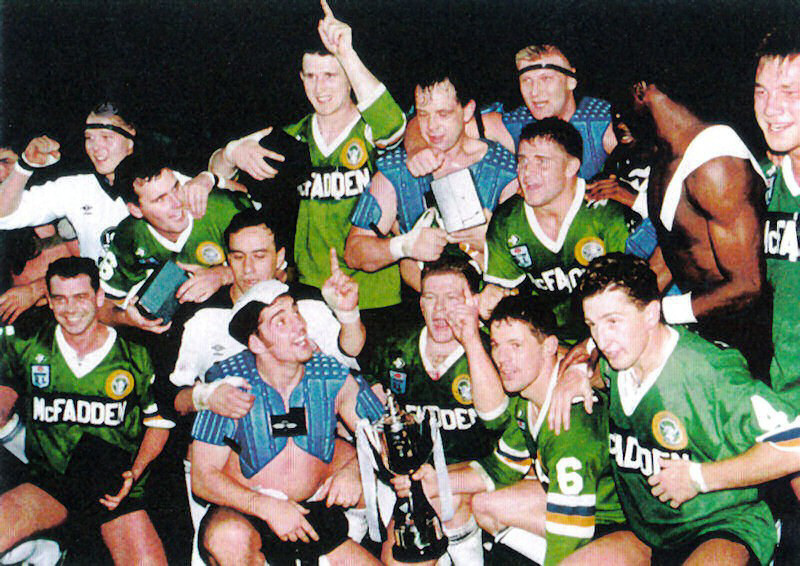 As skipper Kurt Sorensen collected the trophy the celebrations had only just begun for Widnes, the first team to be officialy crowned European and World Club Champions. A fitting tribute not only to some fantastic Rugby League that was evident but to a unbelievable team performance. The ultimate accolade in the club game, the people's game, was won the way it should be, with great skill, determination and above all great team-work.